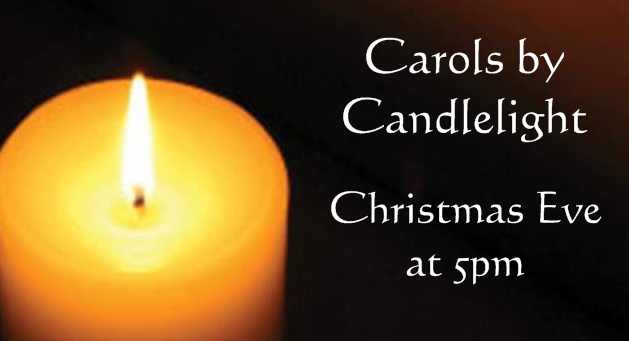 This morning a group of us met up for prayer before we headed off to the High Street to hand out invitations for our Carols by Candlelight, held today at 5pm. We had a good time in the town and handed out well over 500 invite cards in less than half an hour. Afterwards we regrouped and shared a coffee in Costa Coffee before heading home. 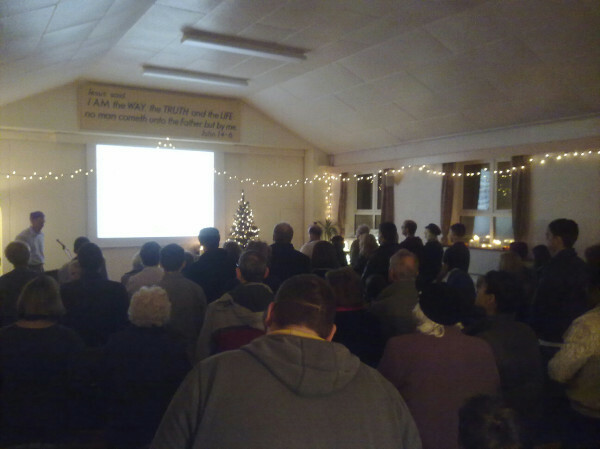 This is the first time that we have held a carol service on Christmas Eve and we were delighted with the response. Earlier in the week a group of us had gone carol singing, also for the first time, around the local roads and had handed out mince pies and sweets. This had also been very positive and well received. Great night carol singing by candlelight. Mince pies, sweets & invites to our Christmas Eve carol service well received. Some 80 people gathered with us this evening for our Carols by Candlelight service to enjoy a tradition mixture of the Christmas favourites and listen to something about the real meaning of Christmas. The service was led by Alan Michael and began with the singing of Hark the herald angels sing, followed by prayer and a welcome to all. The second carol was Silent Night, which was followed by a reading from Jeremy, based around the first subject in our ‘Step into Christmas’ series – Christmas: The Plan. Some of the younger children from Sunday Club came up to sing Away in a manger. This was followed by our second reading, read by Phil Bray and set around verses to highlight Christmas: The Person. Our fourth carol was Once in royal David’s city. After the carol, poems that the children had written about Christmas were displayed on the screen in the form of video clips showing them being read by their authors. This was followed by our final readings which highlighted Christmas: The Purpose and were read by David Angell. Our fifth carol was O little town of Bethlehem. After this, David Hedges came up to speak. He highlighted God’s present at Christmas – the sending of the Lord Jesus Christ into the world – and how easy it was to lose sight of this in among the distractions of Christmas. Our final carol was O come all ye faithful which was followed by prayer. Alan and David handed out presents for those who attend Sunday Club and explained that there was something for everyone to take away with the refreshments offered after the carol service. 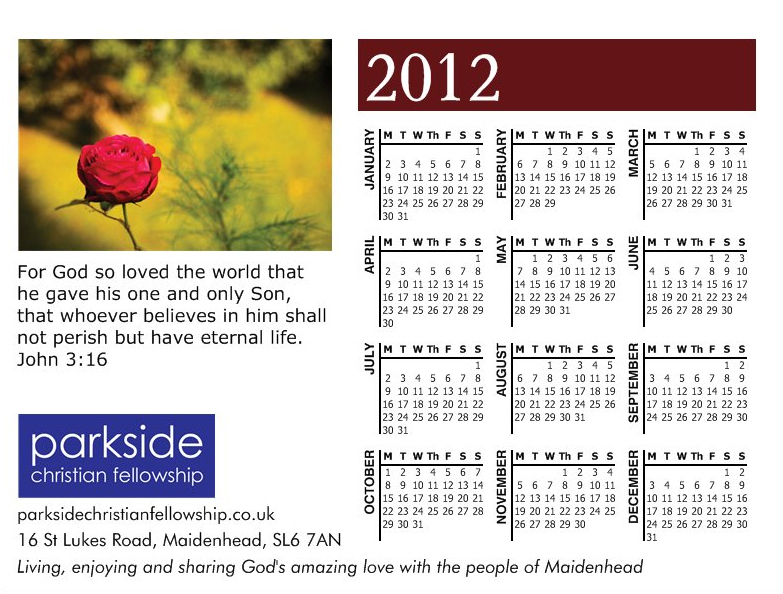 Among other giveaways was a Parkside fridge magnet for 2012, which also proved somewhat popular. Overall, it was a tremendous evening and really encouraging for us all to see the hall full. It’s definitely something that we’ll look to repeat next year.